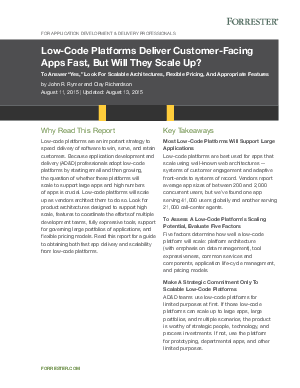 Low-code platforms are an important strategy to speed delivery of software to win, serve, and retain customers. Because application development and delivery (AD&D) professionals adopt low-code platforms by starting small and then growing, the question of whether these platforms will scale to support large apps and high numbers of apps is crucial. Low-code platforms will scale up as vendors architect them to do so. Look for product architectures designed to support high scale, features to coordinate the efforts of multiple development teams, fully expressive tools, support for governing large portfolios of applications, and flexible pricing models. Read this report for a guide to obtaining both fast app delivery and scalability from low-code platforms.